પૅન્ગ્વિનની એક અલગ ચાલ અથવા 'waddle' હોય છે. આજે અમે પૅન્ગ્વિનની અલગ ચાલ પાછળની વૈજ્ઞાનિક સિદ્ધાંત વિશે ચર્ચા કરી રહ્યાં છે. 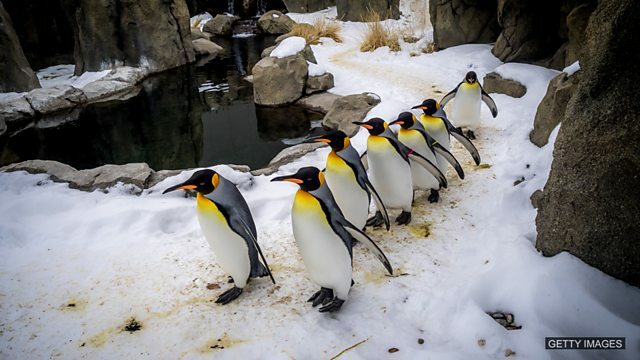 1) How many words can you think of that describe penguins and the way that they walk? 2) How can scientists compare animals today to animals in the past? હેલ્લો. Welcome to Listen here! એક એવો કાર્યક્રમ જ્યાં તમે શીખશો અંગ્રેજી સમાચારોની અંદર ઉપયોગમાં લેવાતા ભાષા વિશે. હું છું રીષી. Waddle એક ચાલવાનો પ્રકાર છે. તે રમૂજ અથવા શોખનું સૂચન કરે છે. સામાન્યતઃ આ શબ્દનો ઉપયોગ નવજાત અને બાળકો માટે થાય છે. Let’s listen to the first part of today’s clip from BBC Radio 4’s Today Programme! Good idea! મહિલા પત્રકાર લંડન ઝુની અંદર પૅન્ગ્વિનો માટે બનેલા વાડમાં છે. હાલમાં waddle ઉપર જે વૈજ્ઞાનિક સંશોધન થયું છે તે વિશે તે જણાવી રહી છે. મિત્રો, સાંભળો અને જાણો કે પૅન્ગ્વિનની ચાલ વિશે જણાવવા માટે મહિલા પત્રકાર ક્યા શબ્દોનો ઉપયોગ કરે છે. With its tiny legs and stiff, upright posture a penguin has a waddle that's more than a little ungainly. But by installing a high-tech track in London Zoo, scientists will measure every tiny movement the birds make. Did you hear that penguin? She mentions posture. Posture એટલે અંગસ્થિતિ. સરળ શબ્દોમાં કહીએ તો ઉભા રહેવાનો અથવા બેસાવાનો અંદાજ. આ શબ્દ મુખ્યત્વે માનવીઓ માટે ઉપયોગમાં લેવમાં આવે છે. મહિલા પત્રકાર પૅન્ગ્વિનોનાં posture ને stiffઅને uprightતરીકે વર્ણાવે છે. Stiffનો ગુજરાતીમાં અર્થ થાય છે અક્કડ. બીજો અર્થ થાય છે કડક. Uprightએટલે ટટ્ટાર, બીજો અર્થ થાય છે સીધું. And she also describes the waddle as ‘ungainly’. Ungainlyએટલે કઢંગું. This means the same as awkward and clumsy. With its tiny legs and stiff, upright posture a penguin has a waddle that's more than a little ungainly. She said ‘that’s more than a little ungainly’. ‘More than a little’નો અર્થ થાય છે થોડું વધુ. Why doesn’t she say ‘quite ungainly’?That’s much simpler! Well, we often say this when we want to suggest something slightly negative in a more positive manner. Plus, the rhythm sounds good. Say it with me to practice! ‘more than a little ungainly’! Can you give us an example now? Hmm… Working with you is more than a little difficult, sometimes! મહિલા પત્રકાર જણાવી રહીં છે કે વૈજ્ઞાનિકો કઈ રીતે ટ્રેકનો ઉપયોગ કરીને પેન્ગ્વિનોનું હિલચાલ રેકોર્ડ કરી રહ્યાં છે. અને પછી એકત્રિત કરેલી માહિતીને અગાઉની માહિતી સાથે તુલના કરી રહ્યાં છે. We can find stones or rocks with animal remains inside them. What’s the name for these? Let’s listen again! But by installing a high-tech track in London Zoo, scientists will measure every tiny movement the birds make. The researchers will then compare this data with penguin fossils. Aha! She said penguin fossils! Fossil એટલે જીવાશ્મ. Let’s pause. આપણે જાણ્યું કે કઈ રીતે આધુનિક પેન્ગ્વિનોનું એક ‘stiff, upright posture’ હોય છે અને સાથે-સાથે tiny legs પણ. Do you think modern penguins are the same as those in the past? Listen on to find out! The researchers will then compare this data with penguin fossils. They think that the ancient birds didn't waddle and had a more horizontal posture with different leg anatomy. The scientists suspect that as modern-day penguins became better adapted to swimming, they became more clumsy on land. So, they aren’t the same!We’ve heard how modern penguins have an upright posture. Penguins in the past were the opposite! They had a horizontal posture. Horizontalનો ગુજરાતીમાં અર્થ થાય છે આડું. Which means they were lying flat! Right! Their legs have probably adapted over time as their posture changed. To adapt એટલે અનુરૂપ બનવું. આપણે adapt to ની સાથે સંજ્ઞા અને –ING સાથે પૂર્ણ થતાં ક્રિયાપદનો સામાન્યતઃ ઉપયોગ કરીએ છીએ. ચાલો ફરીથી છેલ્લાં વાક્યને સાંભળીએ અને જાણીએ કે પેન્ગ્વિન કઈ વસ્તુથી adapt to થઈ ગયા છે. The scientists suspect that as modern-day penguins became better adapted to swimming, they became more clumsy on land. So, penguins adapted to swimming. This means the anatomy,or structure, of their legs changed to become more suitable for water. And that’s why they’re clumsy. ગુજરાતીમાં clumsy નો અર્થ થાય છે બેડોળ. Exactly! So, have you adapted to presenting Listen Here yet? I think I’ve adapted by now! And we hope your ears are adapting to our show! Join us next time to learn more! Say goodbye, Tom! Bye everyone! See you next time! Posture relates to position. It describes someone’s position when they are standing or sitting. You should sit up straight at your desk! A bad posture can cause back pain. Horizontal describes something which lies flat or level with the ground. The opposite of horizontal is vertical. Upright is a synonym of vertical which. It’s commonly used when referring to posture. To adapt means ‘to change in accordance with something’. After I had a baby I adapted my bike – it now has two seats instead of one! To become adapted describes the process of changing when change is influenced by important factors. Otters have become adapted to cold water. They have thick fur which keeps them warm. Anatomy is a noun used to refer to the structure of the body. The anatomy of a shark is perfect for hunting in the sea. They have sharp teeth and can breathe underwater using gills. The subject name for the study of bodily structure is also anatomy. I need to leave or I will be late for anatomy class! જવાબ મુદ્રા સાથે સંલગ્ન છે. Which of these adjectives does NOT mean ‘awkward’? Which word refers to the position of the body when sitting or standing? આજનાં ઍપિસોડમાં જણાવેલ બીજો ઉદાહરણ ક્યો છે. When penguins are lying flat on water or ice we can say their posture is ______. આવાં જ બીજા રસપ્રદ ટૉપિક્ સાથે ફરીથી મળીશું Listen Here! માં, જ્યાં શીખશો સંવાદ માટે જરૂરી અને મહત્ત્વની ભાષા.